'Hate the sin, love the sinner' more sentimental than moral? Posters outside churches are generally uncontroversial. Certainly, those of us whose taste tends to the aristocratic may deplore them on aesthetic grounds. Posters are always a little vulgar. We believe that they should meditate on the experience of the British Royal Family: when they started to go tabloid, trouble followed. It would be far better were churches to return to their traditional broadsheet ways, and to nail their wisest and most pertinent reflections, this article say, to the cathedral door. Occasionally, however, posters arouse anger for what is written on them. 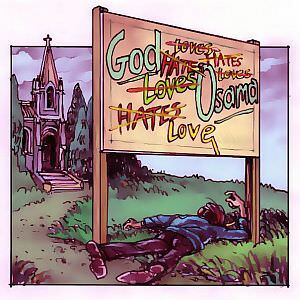 Most recently, churches have drawn fire for posters proclaiming, ‘God loves Osama’. Critics argue that the poster aligns God with the terrorists’ cause, makes light of the havoc they have caused, and remakes God, after the image of the misguided and ineffectual clergy, into a simpering wimp. Church leaders respond that it is perfectly consistent for God to hate terrorism while loving the people who are terrorists. Although this claim lies at the heart of Christian faith, it has always seemed unlikely, never more than in heated times. Even Christians debate among themselves its truth. Some years ago, for example, back-yard theologians on my cycle-route engaged in theological debate on a garage wall. The first proposed the unlikely thesis, GOD LOVES ABORTION, and spray painted it on the wall. A few days later, a revisionist theologian used paint remover and spray can to alter the message to GOD HATES ABORTION. The response was quick. Love was again substituted for hatred, and God’s love was made personal. The thesis now ran, GOD LOVES ABORTIONISTS. The revisionist theologian, a person with few, but decisive, moves, then scratched out ‘hates’ and wrote ‘loves’, leaving the thesis to read: GOD HATES ABORTIONISTS. The first theologian opened up another front and wrote beneath the much altered message, WHO DOES GOD LOVE? The question, unanswered, still weathers on the wall. And that is the central Christian question. In the Gospels, it lies at the heart of Jesus’ conflict with the Pharisees. Does God love only those who act well and faithfully, or does God love the just and sinners alike? For many of his hearers, it was scandalous that one who claimed in his behaviour to represent God’s values ate with prostitutes and traitors. Jesus’ answer was that God loves us when we are still sinners. Or to put it in more modern terms, God loves each human being who comes into the world for who they are and not for what they do. That sounds nice. We can give it sentimental acceptance until we begin to name names, to put pictures on posters. That God should love ordinary, domestic sinners like John Smith and Mary Doe is consoling. But Adolf Hitler, Jozef Stalin, Pol Pot, Osama Bin Laden? In tabloid theology, these are monsters. They are evil and undeserving of love or sympathy. They are forever to be identified with what they have done. To suggest that God loves them is to sentimentalise God, and to remove any firm basis for morality. Public morality demands that we identify people’s value with what they do, and that we classify people as victims, monsters, saints or heroes. A God who hates terrorism must also hate terrorists. This is the argument that re-emerges whenever Christian leaders pray at public ceremonies for enemy soldiers, question the morality of their nations’ wars and their behaviour in war, or organise vigils before a hanging. These activities are seen as subversive, seen to insinuate a God subversive of public order. But this is the Christian God. It would be a mistake to describe belief in this God as sentimental, or the Christian God as cheerily tolerant. A God who sees each human being as precious, and knows each by name, cannot but hate the ways in which human beings deny the value of each human being. Denunciation of terrorist acts, of unjust wars, of oppressive institutions and of trivialising cultural conventions is the other side of caring for human beings as persons. So maybe there are worse afflictions for churches than bad taste. To speak in polarised times of the Christian God will never receive polite applause. What would the world do without Andy Hamilton? Aurora, I could not agree with you more. Loved the opening paragralph, in particular - "It would be far better were churches to return their traditional broadsheet ways, and to nail their wisest and most pertinent reflections this article, for example to the cathedral door. thank you Andy, as usual, subtle and refreshingly engaged theology.Beauty! Our cultural world is full of "what we do" (and all the trappings of success, beauty etc) but finds it hard to deal with "who I am". I hope we Christians can keep asking the questions around who am I, so that we can relook at Jesus' question: Who do people say I am? Thanks again for your insightful views, Andy. It's not just in tabloids that headlines can give distorted views of what comes under them. The heading here describes as "more sentimental than moral" a claim that Andrew describes as "at the heart of the Christian faith". - I liked the article, not least for Andrew's typical balance: insisting on caring for each human, even serious evildoers, but also on denouncing and opposing the serious evils. It's extraordinarily difficult to manage both in practice! Andy, (if you are the Andy Hamilton,S.J. I knew) I was a student of yours almost 30 years ago. I 'm glad to see that you have kept your cutting edge and not become a conservative old fogey. A beautifully crafted piece; halfway through you almost had me biting. God may love the author, but I he might be disappointed with the article. I read it expecting it to begin from the observations in the last few paras which barely set up the problem. Not end with them. This article has barely got going. I'd prefer something a little meatier. I like the summary of Tabloid Theology (where are most of us going to get our Theology?) but the article seems to skirt the central Christian message that Jesus came for sinners themselves, not just as fashion accessories.I think it points us into the mystery of evil and free will. 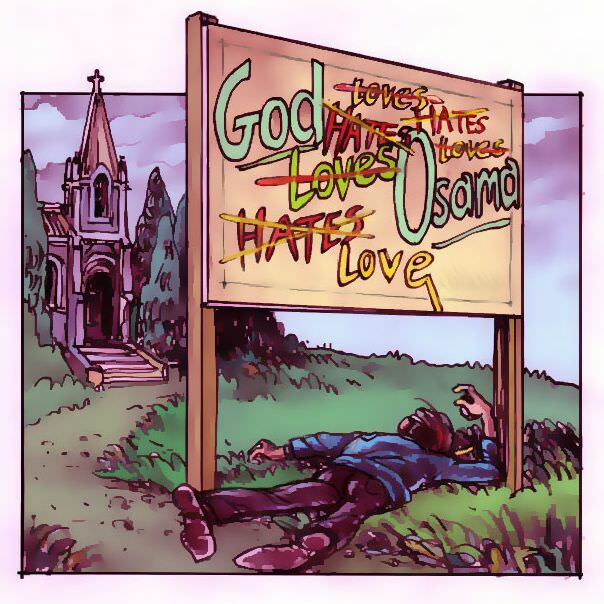 God loves Osama,but does Osama love God? Where is this alleyway? I love graffiti that provokes and questions, there should be more of it, as opposed to slogans and catchphrases and advertising guff selling things we don't need. A God who hates terrorism must also hate terrorists. I have never associated the word hate with God. Hooray for Andrew Hamilton (and for God)! We can't simply brand some-one as hateful and remain Christians. I find it much harder to do this in the case of individuals I interact with each day or whom I see in the news than I do with people in theory ! Well done, Andrew! I once gave a sermon on God's unconditional love for us. Afterwards a woman scolded me for the sermon. She said: "How do you expect us to keep our children good if you tell them that God loves them no matter what they do." It is worth while bringing this topic into the public arena,once again;however,would it be more useful to discuss the idea of mankind's predisposition to project our mode of thinking onto God's. Is projection a useful mechanism to gain some insight into the "mind" of God? great article. The common denominator for those considered to be 'evil' is the killing of inncocent people. I am still baffled as to why it is not questioned to the same extent when it is a country (or countries) doing the killing. Are the countries responsible for the countless deaths of innocent people as a result of war evil? Does god love/hate those in communities that benefit through others suffering? An individual responsible for thousands of deaths is labeled a monster (and rightly so), but a country responsible for tens or hundreds of thousands of deaths is not. Can we honestly justify killing if it is for a political reason? In the midst of his suffering Jesus forgave those who unjustly executed him. We are judged not so much by our actions but more so... by what is in our heart. To a person like Hitler, the capacity for love has most likely been obliterated by his childhood experiences of cruelty and rejection. What God wants from us is to be reconciled to each other with a sincere heart and mind. Hitler was a victim of his childhood and in turn he projected victimhood onto the Jewish people, but how does God view the state of his distorted heart? Surely Hitler is now forever lamenting his deplorable actions whilst simultaneously being held in God's forgiving arms. The osama, the hitler, the pol pot in me is the prodigal returning to the father. Will God, the "Father" see the osima, the hitler, the pol pot? We know God will see nothing but God;s "son". Thanks so much for this piece, Anndrew. It reminded me of speaking to a famous Australian playwright some years ago who I'd just overheard saying he would never write a play about Hitler because Hitler was not a human being. I said to him that the problem was surely that Hitler was a human being. My dear friend Rai Gaita often refers to Kant as having articulated in a secular voice what he, Rai, calls the essentially Christian ideal that all human beings are deserving of dignity. I have a view that human beings have always harboured such a moral sense about each other as this in their souls, although of course societies have never acted according to the ideal of it. It has always seemed to me to be a human perception, rather than a uniquely Christian one, and to be just a bit ungenerous of Christians to claim to have invented it, as it were. I was seeing John Gurry a few days ago and he reminded me that Eureka Street now appears on the web, so I've been having a look. It's lovely to come into contact once again with your thoughts and words. Until John told me you were online I'd thought Eureka Street had gone into the silence. Thank goodness it hasn't. For many Australians, Ash Wednesday is synonomous with the devastating bushfires of 1983. But a thousand years before the bushfires, Christians were beginning the season of Lent with Ashes, ensuring a gritty start for the road to Easter. Every attempt to curb capitalism's voracious appetite, to ‘humanize’ its world-wide dominion, to place the world economy back in the service of the greater good, and thus temper its lust for unregulated growth, has not only failed, but has been assimilated.